An international conference on "Roles of modern technologies in elections: improvement of standards, public confidence” was finalized in Astana, Kazakhstan On November 1-2, 2018. Mr. Mazahir Panahov, CEC Chairman took part at the conference and during the visit he met with his Kazakh colleague, heads of election management bodies of many countries and other official persons. The development perspectives of partnership in different election-related fields and the issues of mutual interest were discussed at the conference. 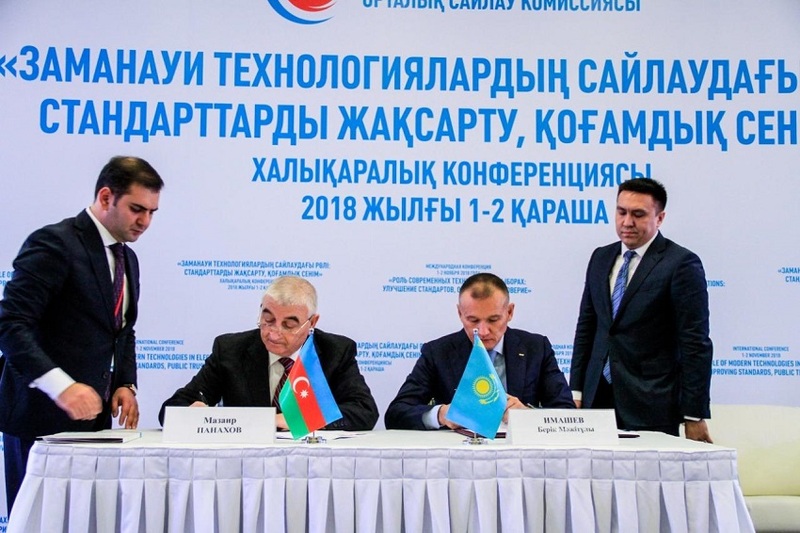 On November 2, 2018 Memorandum of Understanding was also signed between the Central Election Commission of Azerbaijan and the Central Election Commission of Kazakhstan. The Memorandum was signed by Mr. Mazahir Panahov, CEC Chairman of Azerbaijan and Mr. Berik Imashev, CEC Chairman of Kazakhstan. The Memorandum of Understanding targets the intensification of the relationship between supreme election bodies of Azerbaijan and Kazakhstan which is being developed year by year in all fields and strengthening mutual fruitful cooperation in exchange of experience.